Southern Section of Los Angeles Including the Cities of Compton, Gardena, Hermosa Beach, Long Beach, Manhattan Beach, Redondo Beach, Palos Verdes Estates, Seal Beach, Signal Hill, Torrance and the communities of Artesia, Bellflower, Clearwater, Hynes, Lawndale, Lomita, Los Alamitos, Norwalk, San Pedro, Walteria, Wilmington. This is a fine c.1943 map of the southern section of Los Angeles, California issued by the Automobile Club of Southern California. It covers from Forster Road in Norwalk south to Warner Avenue and Bolsa Bay and from Denni street west to the Pacific Ocean. The cities of Compton, Gardena, Hermosa Beach, Long Beach, Manhattan Beach, Redondo Beach, Palos Verdes Estates, Seal Beach, Signal Hill, Torrance and the communities of Artesia, Bellflower, Clearwater, Hynes, Lawndale, Lomita, Los Alamitos, Norwalk, San Pedro, Walteria and Wilmington are included. The map details carious routes in and out of Los Angeles and notes major streets, highways, parks, beaches, piers, individual buildings, addresses and a host of additional topographical features. 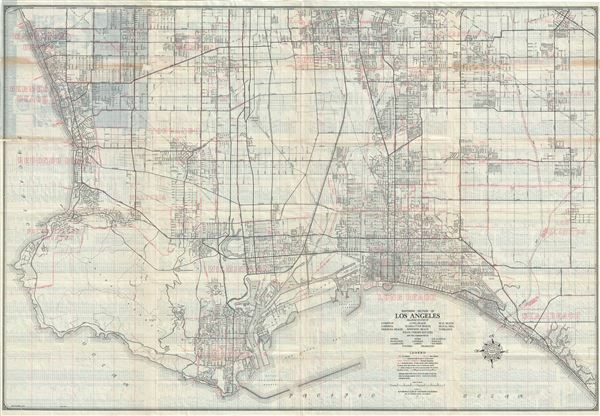 The map was copyrighted and issued by the Automobile Club of Southern California, 2601 So. Figueroa Street, Los Angeles as map number 1930. Very good. Minor wear and toning along original fold lines. Some wear and repair along fold lines in top left quadrant, with minor portions of map missing. Professionally flattened and backed with archival tissue.